Alfreton's Jordan Sinnott scored the first goal. 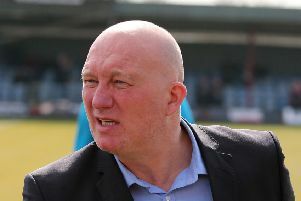 ﻿Despite cruising into a seventh minute lead, Alfreton Town failed to capitalise at Leamington FC and eventually succumbing rather tamely to a 3-1 defeat. Jordan Sinnott’s volley from a James Clifton delivery had given the Reds the advantage, but early confidence quickly waned after Richard Peniket’s 13th minute header from a Dec Bacon cross appeared to go over the line before being cleared behind for a fruitless corner. A rather benign period ensued with Leamington beginning to probe and push. 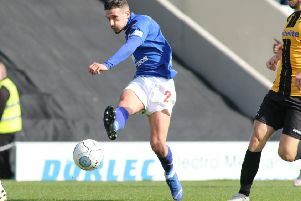 The hosts inevitably drew level on 34 minutes with an untidy goal following a corner that allowed Connor Gudger to pump the ball into the box, where Callum Gittins’ first touch was scuffed only for the striker to react first and fire home. A poor defensive clearance was intercepted by Jack Rowlands to set up Jordan Murphy for the Brakes to take a 53rd minute lead, then eight minutes later the Alfreton contingent were up in arms when Clifton’s swerving shot from wide right was clearly dropped over the line by keeper Tony Breeden with no goal awarded yet again. That seemed to take all the fight out of the Reds and it was only a matter of time before Leamington added a third when Gittings’ header wasn’t cleared and Jack Edwards followed up with 21 minutes left.